This is a sponsored conversation written by Wrapped Up N U on behalf of Community Coffee. Let's face it, all coffee is not created equal. It can't all be made in the south like Community Coffee. I was thrilled to be able to team up with this dime of a company and feature them in my holiday gift guide. 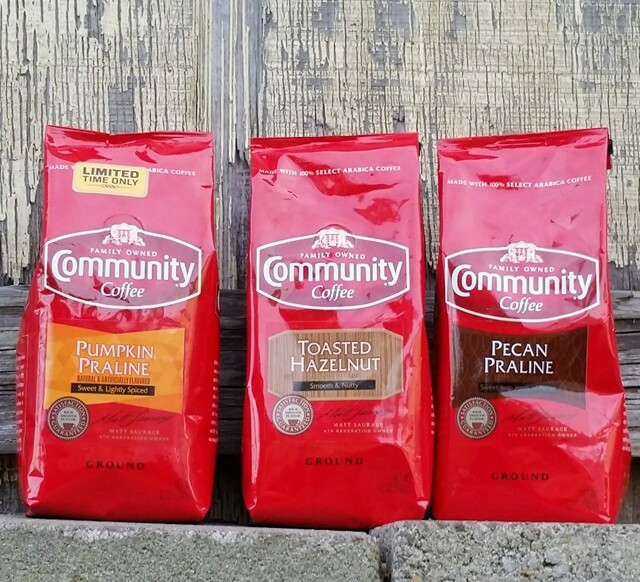 Community Coffee was a brand I had never heard of or tried until about 2 years ago. This coffee is roasted in Baton Rouge and the headquarters are also located there. My friend, Jaime who lives in Louisiana sent me a bag of the Southern Bread Pudding flavored coffee and it was love at first sip. I really love that a lot of their coffee is based on southern flavors and traditions. I was thrilled to even find a gas station in our town that uses the Community Coffee as it's choice brew. They offer a King Cake cappuccino that I absolutely adore! We were sent these 3 flavors to feature in our holiday gift guide. I personally love receiving coffee for the holidays, individual bags make a great hostess gift. You could also add it to a gift basket or use it for a stocking stuffer. Check a store you today for availability or order online by clicking here. With delicious hints of pumpkin spice and toasted pecans, this satisfying medium roasted coffee is a seasonal favorite.Since this is a seasonal flavor I HIGHLY recommend buying more than one bag because once it's gone it's gone. Enjoy the rich, smooth flavor of warm, toasted hazelnuts perfectly balanced with medium roasted coffee. I personally am not a big hazelnut fan, so for me to say I liked this speaks volumes. It has a mellow flavor of hazelnut without being overpowering or fake tasting. Steeped in the Southern flavors of creamy pralines and sweet pecans, this Pecan Praline flavored coffee is a truly delightful treat. Being a Georgia girl raised on sweet tea and pecan pie, this was my absolute favorite of the 3. How can something taste heavenly and sinful at the same time? Well, bless your heart...you will just have to try it to understand. My Mom always liked Community Coffee. It's really pretty great coffee. I have heard of this coffee, but have never tried it. All those flavors sound delicious! I will have to give Community Coffee a try. I love that it is a family owned and operated company! Thank you for a great review!